During the weekend of 22–24 February, the Executive Committee was welcomed in Prague by its Vice-President, Ms Lidmila Nemcova to gather with the European elections in mind. After a short opening statement by our President, Ms An Hermans and Ms Lidmila Nemcova, we were honoured to welcome Mr Daniel Herman, Vice-President of the Christian Democratic party KDU- ČSL and former Minister of Culture, to share his thoughts on today’s society and tomorrow’s Europe. As to the formal part of our Executive Committee, the Members of the Executive Committee unanimously adopted the budget on the proposal of the Presidium, including a limited raise of the membership fee. The Presidency also took the opportunity to present their recent publication ‘United in Solidarity’ and the Annual Report 2018. To close down the first session of our Executive Committee, an excellent women choir brought us the best of Czech and Slovak classical music. After a refreshing first day of fruitful discussions, we went on with the main theme of our meeting: Ambitions for Europe: the 2019 Elections and Beyond. Firstly, a panel of three different Czech generations elaborated on how society has changed over the years. From the ferocious Second World War over the brutal invasion of the communists to the harmony of the European Union, several aspects of day-to-day life were discussed during this unique insight in everyday Czech life. Therefore we would like to thank our speakers, Ms Olga Bezděková, Mr Ivo Mareš and Ms Lidmila Nemcova, for the moving stories everyone could learn from. 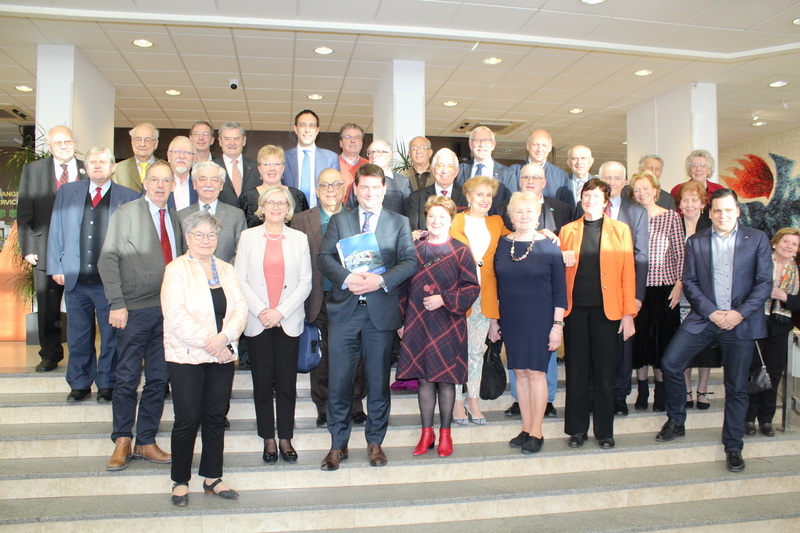 After these perspectives on the future, we welcomed Mr Peter Van Kemseke, climate expert and former Deputy-Head of Cabinet Herman Van Rompuy, to discuss the impact of climate change and the solutions that could be provided for on all different policy levels. He underlined that the climate is not yet a top priority according to the Eurobarometer, but is moving upwards every year. It was also shown that climate changes are causing a wide array of problems in several domains, such as security, energy, health, migration, economics,… Mr Van Kemseke therefore urged for a thorough and transparent execution of the Paris Agreement in which economic growth does not contradict with the reduction of greenhouse gasses. According to the speaker, the European Union should use its diplomatic leadership to convince other countries of taking the right steps. All chains in the decision-making mechanism are having a responsibility, so also local governments have a key to success with regard to the climate. With this excellent discussion on stewardship in mind, we had the opportunity to listen to the insights of Father Miloslav Fiala about the key value in a Christian-democratic European Union, namely solidarity. He enlightened us with some interesting thoughts regarding the religious concept of solidarity and the importance of fraternity in our community. This enriching discussion was the perfect lead-out to the next esteemed guests: Mr Tomas Zdechovsky, Member of the European Parliament, and Mr Dara Murphy, Campaign Director of the EPP. They jointly elaborated on the methods and actions that will be launched in the run-up to the European elections. As the overarching senior association within the EPP, we were invited to give input on the Manifesto that will serve as a programme for our Spitzenkandidat, Mr Manfred Weber, during this campaign. Subsequently, there was an inspiring discussion on the concrete plans and intentions of our members with a vibrant Q&A, leading to a vivid discussion with both Mr Murphy and Mr Zdechovsky. All work and no play makes Jack a dull boy. Therefore, we took the chance of being guided around some historic places in Prague with the splendid knowledge of Ms Nemcova and her husband as guides for the evening. On Sunday, we organized our meeting succinctly with some tips and tricks on the use of social media in the campaign and with a wrap-up of the previous discussions. With a productive three-days gathering in mind, all participants could leave Prague with good memories and a refreshed engagement to jointly work on a better Europe.